Early 2016, I bumped into a seat sale promotion which perfectly coincided with my homecoming trip. I have been planning to bring the parents to Bangkok and Phuket has been in my travel bucketlist for so long; hence I took the cheap flight offer as a sign to make a family trip happen. 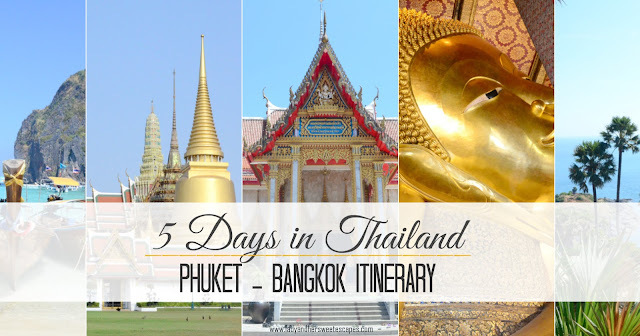 Wanting to make the most of our less than a week stay in Thailand, I quickly jotted down a Phuket and Bangkok itinerary never really knowing if it's doable for our family or not. Thankfully, although it was quite a hectic schedule for the seniors, my itinerary worked! 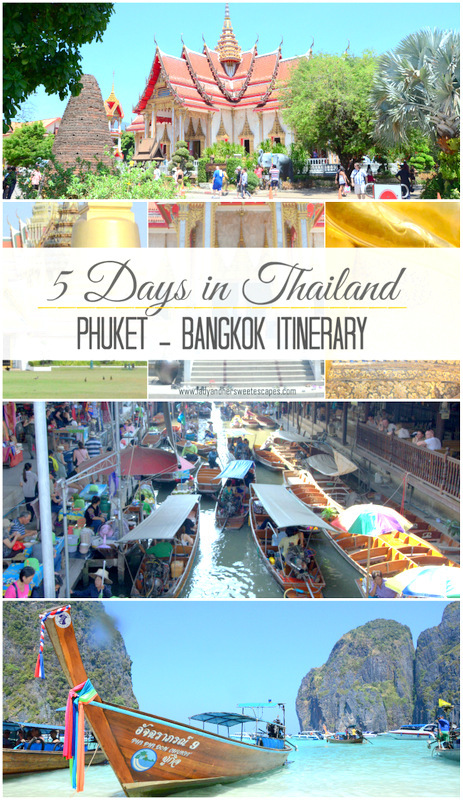 Here's our Phuket - Bangkok 5-day tour itinerary. As expected, our flight from Manila was delayed for two hours. We were supposed to arrive in Phuket at 10:00 PM, but it was already half past midnight when our plane landed. It took us around 30 minutes at the passport control and baggage claim, and at 1 AM we were welcomed to Thailand by a man holding a placard with my name on it. Thank goodness he was still smiling despite the delay! I booked the two-way airport transfer at Phuket SRC Travel website for 1,400 THB (plus 200 THB due to early pick-up) during our travel date - March 2016. Patong is an hour drive from Phuket International Airport. It was already 2 in the morning when we checked-in at The Frutta Boutique. It is an affordable accommodation in the most touristy town of Phuket. After a few hours of sleep, we commenced our Thailand trip with a private Phuket city tour. We rented a family van for 6 hours and asked the driver to take us to the attractions we want to visit. I opted to book all our tours in Phuket at Phuket SRC Travel as it was more convenient for me in terms of communication. Their rates are pretty reasonable as well. For a flexible city tour itinerary, I paid 1,700 THB. Here's our city tour schedule. We rest a little, then headed out for dinner. We rode a tuktuk from The Frutta Boutique to Bangla Road to experience the infamous Phuket nightlife. It was time to cross out #8 in my 20 before 2020 list! For more details, kindly refer to this blog post: Island Hopping in Koh Phi Phi. This all-inclusive island hopping trip was at 1,800 THB per person. It was our last day in Phuket; hence, we hurriedly went to Patong Beach to catch the sunset. It was then followed with a Thai street food dinner. We flew from Phuket to Bangkok via Nok Air - a Thai domestic budget-airline. Service was excellent. Light snack was served on board without additional fee. Unlike Phuket, I did not arrange an airport transfer in Bangkok as I have read that traveling to and from the airport is easy via public transportation. There is a designated taxi stand outside the airport. I simply showed our hotel address and the journey was a breeze. Taxi rate is based on meter plus 50 THB airport surcharge. Chang Siam Inn is a lovely and affordable accommodation in Makkasan. But based on our experience, I would rather not recommend it for those who will only spend two nights in Bangkok. The location is quite far from the BTS. It is 10 minutes by foot from Ratchaprarop station, then we had to take a train to Phaya Thai which is connected to Phaya Thai BTS. BTS is Bangkok Skytrain with two lines which run through the main attractions in the city. To ride the BTS, you need to purchase a Rabbit card for 80 THB plus a minimum 100 THB top up. It is quite similar to our Dubai Metro NOL Card. We had a short rest at the hotel, then took the train to Terminal 21. It is a travel-themed shopping mall; each floor was built to look like a world-famous city. One of the floors in Terminal 21 made me feel like I was back in Istanbul. And other floors took me to Tokyo, London and San Franciso! We had our late lunch in Tim Ho Wan - known as the "cheapest Michelin restaurant" in the world. Just in time for sunset, we took the boat to Asiatique. It is a large night market with entertainment, retail shops and restaurants. To get there, alight in Saphan Taksin BTS and ride the Asiatique's free shuttle boat in the pier. We opted to take a tuktuk to our breakfast spot instead of riding the train to save time. One-way tuktuk fare from the hotel to a BTS station is 100 THB. Our main itinerary for the day started in Sathron Central Pier in Chao Praya River. After temple hopping in Bangkok, we took the BTS to a famous shopping mall. Apparently, this mall was the world's most instagrammed place in 2013! 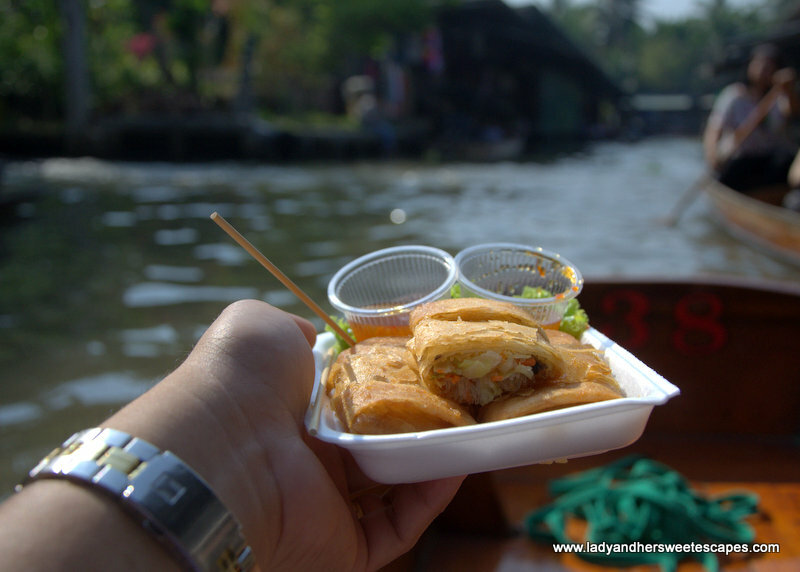 I booked a floating market tour for our last day in Bangkok. A DIY visit to the floating market is possible, but since we didn't have a time to waste, joining a guided tour was the best option. We checked out at the hotel before the tour and stored our luggage in the lobby as our flight to Manila was still at midnight. 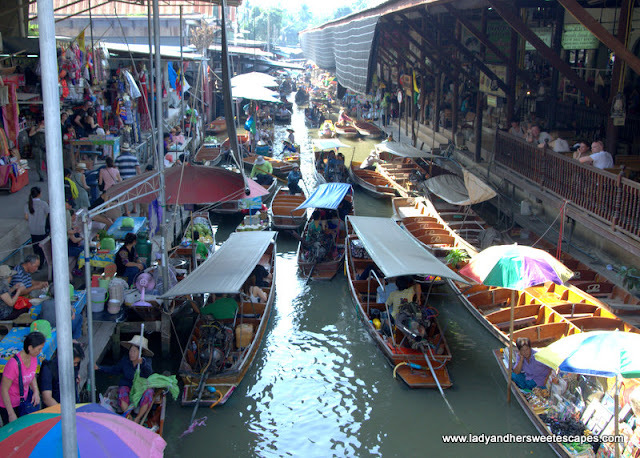 Damnoen Saduak has the most popular floating market in Bangkok. It is vibrant and very touristy. Food was affordable, but souvenirs were extremely expensive! The tour costs 800 THB per person. 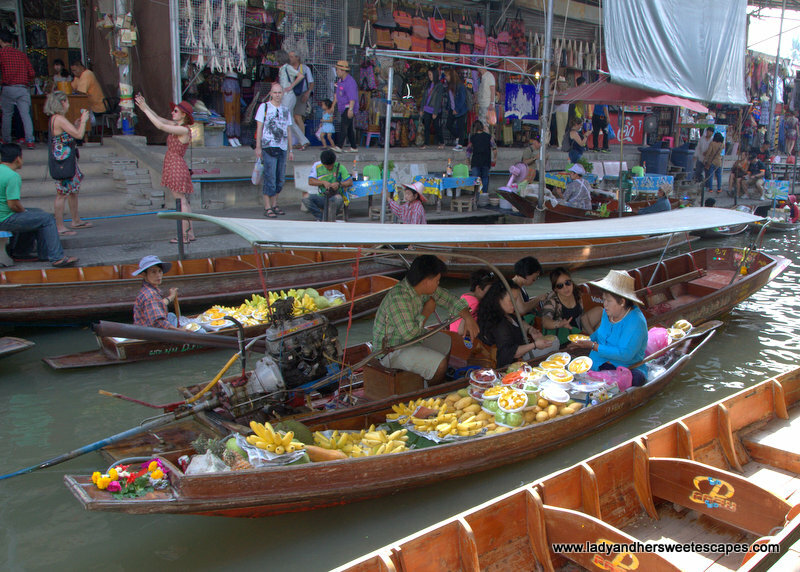 Our floating market tour includes a stop at Chang Puak Camp where elephant rides are offered. I highly advice not to patronize this activity though! Guided tours are never complete without a souvenir stop. So, we spent an hour in a woodcraft shop. Since we still had extra hours to spend in Bangkok, we went to Platinum Mall for early dinner and some last minute shopping. Update: Since I've been getting lots of messages on travel expenses, here is an estimated budget for this itinerary, excluding flight tickets. 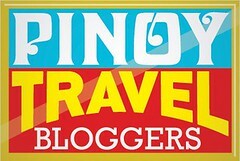 Searching for more travel itineraries? foto Anda sangat bagus, Phuket dan Bangkok adalah tempat yang sangat indah di dunia. Jika Anda tertarik dengan perjalanan ke Indonesia, kunjungi treya untuk paket tur yang terjangkau. Singapore is a little yet prosperous island country, both a city and a nation, found simply off the southern tip of Peninsular Malaysia in Southeast Asia.